Though I cannot say I was one of the lucky few to discover DELUSION SQUARED upon the release of their debut in 2010, I was at least made aware of the band through a healthy buzz about this French act’s promising sound. 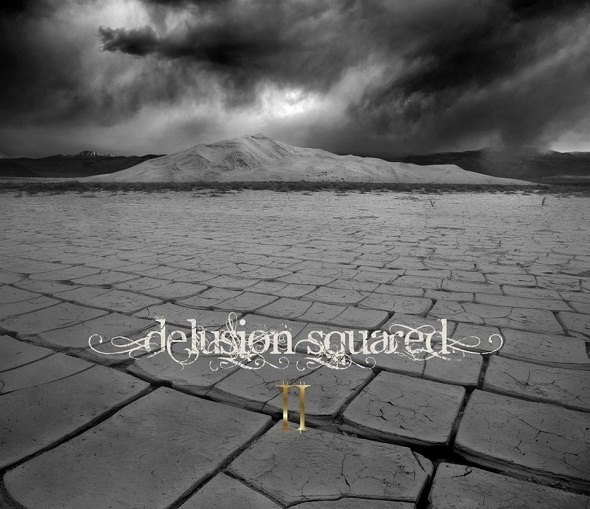 Although female-fronted prog and metal bands seem to come wholesale nowadays, DELUSION SQUARED offers listeners an exciting and distinctly modern take on prog that builds upon the success of their first. Blending the strange with the accessible, ‘Delusion Squared II’ has left me wanting more from the trio. DELUSION SQUARED does not innovate an entirely ‘new’ sound in prog rock, but they are eclectic and distinct enough to make them difficult to concisely describe. The songwriting is dominated by Lorraine Young’s highly melodic vocals, yet- in opposition to the majority of prog rock-related bands who go down that route- there is no sense of them pursuing an AOR, or ‘tame rock’ sound with their music. Young’s vocals have a pretty sound to them that might not sound out of place on an indie pop LP, but the music is constantly morphing into new exciting shapes. With that in mind, I may describe DELUSION SQUARED as a band defined by an uneasy balance; a balance between catchy vocal hooks and schizoid songwriting, between its electro-ambient soundscaping and quasi-metal riffing, its frightening sonic density and stunning melodies. The highlight of ‘II’ is certainly Lorraine’s voice; it sounds angelic, and above all, distinctive. Far too often, I find that female voices in prog rock and metal tend to fall into a generic category. Aided in small part due to her cute French accent, Lorraine Young carries a charm with her powerful vocal delivery. The instrumentation by comparison is quite challenging, and- as previously mentioned- is constantly changing up its pace, even transcending the boundaries of style. Within a single song, listeners may expect to hear everything from metal, to ambient, to pop and vintage-inspired prog rock. With musical ideas being tossed around wildly, it becomes difficult to pinpoint particular songs as ‘highlights’, although the mini-epic ‘Necrogenesis’ and the tender ‘Naked Solipsism’ stand out for their stirring melodies. For all of their ambition however, DELUSION SQUARED’s production feels the strain of so much activity. Although it may simply be that Lorraine’s vocals are mixed a touch too highly, the instruments occasionally feel drowned out by one another, although in a sense this only serves to emphasize how textured the band’s sound can get. Suffice, DELUSION SQUARED are one of my favourite discoveries so far of the year. They are are wonderful demonstration of what prog rock can do even almost half a century after its birth.